Space has been a terrific galloper for the stable and at Pakenham on Thursday added another victory to a good record that has seen him amass over $220,000 in stakes. Too bad to be true when finishing down the track at Moonee Valley (where he has failed in the past) at his previous outing, Space (pictured) appreciated the roomier track and he relished every bit of the 2500m. Always travelling well midfield for Steve Arnold, the son of Dubai Destination snuck closer as he neared the turn, looming up four wide into the straight and getting clear after hitting the lead with 200m to go. "He really wanted to win that," a delighted Greg Hoysted said, "he really attacked the line." The winner of five of his 36 starts, Space hails from one of New Zealand's most prolific families, one that has produced the big race winners The Phantom Chance, The Phantom, Irish Chance, The Jewel and The Twinkle. The stable's horses have been in great form of late and we are looking forward to that continuing over a busy weekend which sees Ballymore saddle up eight runners at five different meetings. "It is a pretty tough assignment," Michael Moroney admitted, "but we could not be happier with him and the rain on Thursday night will have enhanced his chances." Proven at stakes level, being Listed placed at Flemington last spring, War Legend was a gutsy winner at Pakenham last start and strips all the fitter third up for the in-form Ryan Maloney. The Listed Bendigo Guineas is Saturday's feature and we have Tivaci who looks nicely placed off a drop in grade having contested the Australian Guineas at his most recent outing. A Group 3 winner at his previous outing, the son of High Chaparral endured a tough run in the Guineas which is of some concern leading into this race but he has not done a great deal since that run and appears to be in good order. "He is back in distance but he is fit and we want to get him back on track to see if we can still get him to the Sydney carnival," said Moroney. We take three horses to Geelong on Saturday, the first of which is Elite Rock who has gained a run as emergency in the second event, a 1400m maiden. Covering ground at debut, the full sister to last weekend's unlucky Australian Cup runner-up Awesome Rock was doing her best work late over 1200m and looks suited up in distance. "She has had a jump-out since and she was very good, she seems to have turned the corner on the track and we are expecting her to improve quickly." First up in the Geelong St Pat's Cup, Black Tomahawk was last seen contesting the Herbert Power Stakes in the spring having won the Listed Harry White Stakes at his previous outing. Whilst obviously at his best over longer trips, the Seul Amour six-year-old can race well fresh and whilst he has his share in weight he is the best horse in the race. "It would no surprise to see him pull out a run," Moroney said. Lord Barrington is the third of our Geelong trio, topweight in the Australian Bloodstock Handicap. "He has not drawn well (barrier 16) but rain about will help him and he was very good first up." 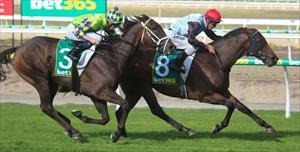 We also have two Kembla Grange runners on Saturday, Power Of Patch and Nordic Duke. The former, described by Moroney as "a really nice horse", only just missed out on the prize when resuming at Newcastle a few weeks ago and he has progressed well since. "He should clear his maiden quickly." On Sunday we head to picturesque Yarra Valley with the improving Keen Desire who stepped up in trip last time, running her best race to date. "She has trained on well and should prove hard to beat."